WHAT INSPIRED YOU TO LAUNCH JETTY STREET PRESS? I wanted to create a kind of clean and contemporary illustration of the local landscape that wasn’t too twee or whimsical. I also wanted to try and avoid the obvious views of Cornish villages and capture some of the lesser known views, the nooks and crannies of a place as well as the bigger picture. As with most of these things, they started out as doodles in my spare time and developed into something much more involved. 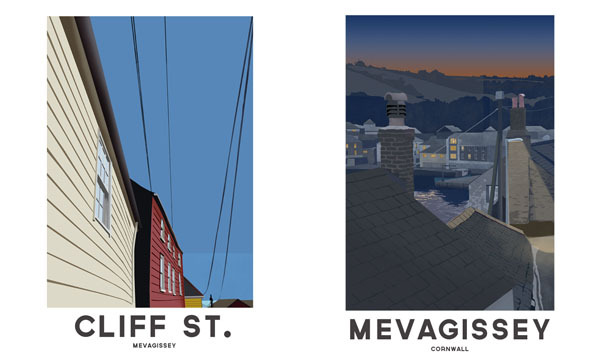 I’ve been inspired by the gorgeous vintage Great Western Railway posters and the illustrations of Brian Cook as well as graphic novel artwork. WHERE DID THE NAME JETTY STREET PRESS COME FROM? One of the first prints I completed was of Jetty Street in Mevagissey. It was something of a turning point in my thinking that these doodles could become something much more. 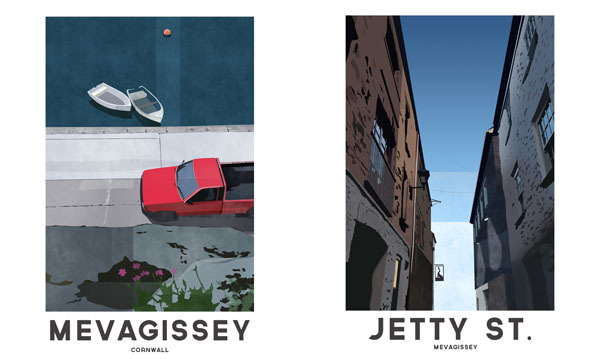 WHAT DO YOU LIKE ABOUT MEVAGISSEY? I’ve always lived in this area, it’s where I grew up. I’ve tried to leave several times and have travelled a lot but I always seem to get drawn back here. I love this patch of coastline, right down to the Roseland. I love walking its footpaths and swimming out of its quiet coves. I love the way it constantly changes. There can be a beautiful still calm sea one day and a wild raging storm the next. And of course, I love it because it’s home, I have a lot of friends and family around here. HOW DID YOU GET INTO GRAPHIC DESIGN AND DID YOU HAVE ANY FORMAL TRAINING? I studied photography at art college but I’ve always loved design too, so it just seemed a natural thing to do. Aside from an A-Level, I haven’t had any formal training in graphic design and have learnt on the hoof over the last few years. Setting up Design Room with Em and Chris was a way of making a living in Cornwall whilst doing something we love and we’ve never looked back! YOUR PRINTS ARE ORIGINALLY BASED ON PHOTOGRAPHS. HOW DO YOU GO FROM THAT TO THE FINISHED PIECE? They’re all based on iPhone snaps. My iPhone has become my digital sketchbook, it’s always with me and its great for a quick snapshot. I then work from this snap in Photoshop. I draw each and every line and build up layer upon layer of colour, texture, and shadows until I’m happy with it. It’s quite a long process, but I find it quite absorbing. There’s no quick fix filter in Photoshop to do it for me! WHAT DO YOU THINK ABOUT THE CREATIVE SCENE DOWN HERE IN CORNWALL? It’s interesting, vibrant and growing all the time it seems. There’s some incredible work coming out of Cornwall at the moment. It is an exciting time to be here. WHAT’S NEXT FOR JETTY STREET PRESS? Drawing, drawing and drawing! I’ve got a list of places around Cornwall that I intend on visiting over the winter months so I can expand the collection of prints. I’d also like to work on getting them more widely available for sale. 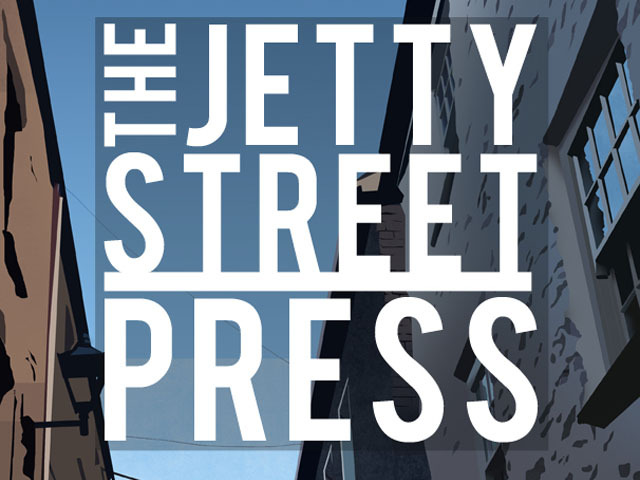 I’m genuinely excited about the Jetty Street Press and what’s to come. 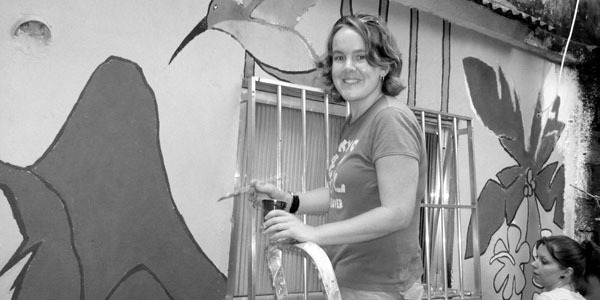 All images courtesy of Sally Mitchell, Jetty Street Press.